In the third of this close season series it is great to welcome Craig Salt (@saltyinsheff) to the pages of A United View with his memories of a Blades legend who, as the song said, could do magic. Why not share your memories of TC in the Comments section below. I don’t remember my first game at Bramall Lane, what I do know is that I was little more than 18 months old, the ground had only 3 sides to it & a cricket pitch covered what is now the South Stand & car park. I don’t remember the tour around the inner workings of the old John Street Stand and the player changing rooms or receiving the leather ball (complete with lace) signed by all the players, including the player that would become & to certain extent still is My Blades Hero. 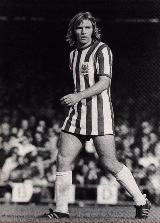 What I do remember is badgering my dad to buy me the full kit. What I do remember is asking if I could have the number put on the back of the shirt & on the shorts (yes, shorts had numbers on them too). What I do remember is wanting to be out in the garden, in the kit, kicking the ball & pretending to be … Anthony William Currie or TC to you and me. I remember the shock of long blonde hair & would take umbrage at claims that he was a lazy player, because at the time he was my footballing hero. I remember talk of his pinpoint passing ability & crucial goals that he scored. I remember insisting that I wear the whole kit every time we went to a home game. I remember slowly moving away from my Mum to spare my embarrassment from being with the one woman megaphone that she was. I remember being truly heartbroken when he was transferred to Leeds. LEEDS of all teams! The only thing worse to a child would have been to travel across the city to the "Dark Side" at S6. I remember that at about the same time I stopped going to games, partly because TC wasn’t there & also because my Dad started to work more Saturdays. My interest wasn’t rekindled until my teens, when I started to go to the games with mates & on the odd occasions with my Dad & his workmates. I’ve watched countless reruns of programmes from the telly, I’ve seen bits & pieces over the internet. Still to this day I don’t understand how he didn’t gain more than the paltry 17 caps for England. What I do admire when I watch those clips & old shows is the way he covered the ground so laconically. I enjoy the way the commentators from the early 70’s obviously thought (like I did) he was a class apart. I remember the classic Motty line from when United beat West Ham “A quality goal from a quality player” & the one goal that really sticks in my mind is his goal for England against Hungary that he hit from outside the box, even though he wasn’t playing for United at the time. The same laconic run up & effortless execution of strike to the keeper’s right & into the net, it still makes me smile when I think about it. I like the way, that despite his travels & career around the world he chose United as his home to come back to & give something back to the kids of Sheffield in his role as Football in the Community co-ordinator. He is still my Blades Hero!